The time immediately ahead will puzzle many, so quick will be the changes, political, economic and social, which will manifest, and so frequently will these changes occur. For many, anxiety and puzzlement will be the major response. Intrigued or alarmed by the nature and extent of these changes, many will see them as signs of a transforming society, while others will fear and resent the new manifestation. People everywhere will act warily, unsure of the right direction for them to take. Not for long, however, will men act thus. They will find that it is a truly changing world in which they live, beset with greater challenges to their beliefs and values. Thus will men begin to establish the new out of the old, and to demonstrate their growing ability to respond to the challenges of the time. Q. Is Maitreya still in the Middle East? Q. Does this mean that His focus is on the Middle East to the exclusion of other problematic areas in the world? Q. Is Maitreya urging religious and civic leaders to eschew extremism? A. So far as is possible. Q. Are the leaders of various faiths in the Middle East starting to respond to His appeals? Q. Has Maitreya appeared on television in recent months (since China)? A. He has resumed his interviews in China. Q. Does Maitreya occasionally still appear in any of the countries where He has already been interviewed – for example, China, Russia, Brazil and the USA? A. Just China, as far as we know. Q. What is the Spiritual Hierarchy’s point of view with regard to the publishing of cartoons making fun of different faiths? A. They are against it. Q. How would your Master and you define freedom of speech? What, if any, are the limits of this fundamental right? A. The limits are clear when they upset right human relationships. Q. Please, could you explain: what is it that makes some nations wiser than others? A. The people are older (in terms of evolution). Q. In His most recent article your Master refers to change that is to come – whether welcome or not; to what sort of change is He referring? A. Change in every field of human endeavour. Q. Two bronze sculptures have recently been attributed as being the work of Michelangelo in 1508. They depict two naked men, each with one arm aloft in a triumphant gesture, and both are riding panthers. If authentic, they would be the only bronze sculptures by Michelangelo that survive. Can you please throw any light on whether or not Michelangelo was their creator? A. My information is that they are not by Michelangelo. Q. How dangerous is the situation in Ukraine and its relations with Russia according to your Master? A. It has its dangers but the Press (generally) exaggerates this. Generally speaking the eastern and western groups are coming to a working understanding. A. (1) It is generally accurate. (2) Yes. Q. Greece has just voted against austerity measures. In Spain, Podemos, a popular anti-austerity party, is edging ahead; should we expect to see more anti-austerity popular movements around the world? Will this encourage other countries, including Britain, to protest more? Stand at the National Book Fair, Ljubljana, Slovenia, November 2014. After an intensive period of preparation for the 30th National Book Fair, in November 2014, where our group participated with the books of Benjamin Creme, the day finally arrived when a co-worker and I were setting up our stand. The opening was on the following day and all the publishers were very busy preparing their stands. There were no visitors, yet all of a sudden an older lady appeared at our stand pointing to the photo of Maitreya’s ‘hand’, saying it was like her hand (and her hand was truly quite long because she was very tall). I started explaining whose hand was on the picture and noticed that the lady was dressed in just one colour. Her hat as well as her coat, sweater, tights and shoes were all in Bordeaux red. Only a brooch on the lapel was shiny white and very beautiful. She was quite self-confident, so I carefully talked about the touchy topics like reincarnation and teachers who appear at the beginning of new era etc. After a while to my and the co-worker’s surprise she began talking about one religion, one humanity, one language, she even mentioned karma. Later the co-worker said, “She seemed to know everything.” Was it Maitreya in disguise? At the Globalization Conference in Oslo arranged by Norway Social Forum, 1-2 November 2014, Share Norway had a stand where we distributed newspapers and pamphlets about Maitreya and His message. On 2 November, a young man approached the stand. From his appearance he might have come from the Middle East. He wore a black jacket and had a canvas shoulder bag with the Palestinian Flag and “Free Palestine” written on the front. He spoke Norwegian. I asked him if he had heard of Maitreya and the Masters of Wisdom, but he did not answer, he was looking at the newspapers and pamphlets. I started to talk about Maitreya and His message of justice and peace through sharing of world resources, about the Day of Declaration, etc. He collected pamphlets and the newspaper about the Reappearance, and before he left he said: “Keep up this important work,” and then he left. I was startled, and afterwards I have wondered if he was someone special or a regular man? On Thursday 8 January 2015, I played the flute at the opening of an art exhibition entitled ‘The Golden Age’ at Gallery Alga in Izola, Slovenia. I did not know the artist and it was a ‘coincidence’ how I arrived to play at this exhibition. The paintings were very calming and inspired me while playing. The energy was so powerful that I felt like I was going to cry in between playing. It was really a beautiful and memorable experience. After the presentation, a tall man approached me. He was dressed in a long light brown coat and had a very unusual grey-yellow complexion. He spoke with great enthusiasm. It seemed to me also that he had disordered teeth which he tried to hide every time he smiled, as if he was trying to apologize for them. I was very surprised because he knew so much about the flute, its history and even named famous flautists. It was strange he mentioned exactly those names which I personally really appreciate and admire. Our conversation was interesting – I felt like he read my thoughts, and I totally understood in advance what he wanted to say. We talked a lot and, of course, we also came to the topic of Maitreya and the Masters of Wisdom, as he wanted to check what I think about the events in the world and relations between people. I was very inspired after this meeting with a stranger, and the conversation remained deeply in my heart. Would you be so kind and please tell me whether this person was someone special and if so, what was his role? My son suffered terribly, since age 8, with obsessive compulsive disorder (OCD). All those years he just wanted to die. He is now 29. While with him in Seattle, helping him to get through this two years ago , I decided to place my hand on Maitreya’s ‘hand’. This I did each morning asking that my son be released from this assault on his brain. After one particularly terrifying day of him dealing with his OCD, I dropped to my knees and sobbed for a sign that our prayers had been answered. I specifically requested that it be THAT very day and also a sign both of us would see. I had nothing in mind but I was desperate for my child. A couple hours later my son came out of his room and pointed out a HUGE vivid rainbow just outside the balcony sliding glass doors. It was so big and so near I felt I could touch it. It arched over the roofs of the houses just across the driveway. We both watched in wonder. It didn’t last long but I took it as a sign that all would be well. Since then, his OCD has improved so that now I see no signs of it. He told me that a couple times he felt a tingling all over his body after prayer. I don’t know for sure what that was, all I know is that his OCD is gone. His brain chemistry has been changed and normalized. Even though he still struggles with shyness and social skills, he now has a wonderful job whereas before he couldn’t even work. I believe that rainbow was sent to us to let us know that our prayers were being heard and that we were not alone. Thank you, Maitreya. Today, 3 January 2015, I went to the Big Lots store in Galveston, Texas, looking to purchase a lamp in the appliances section. I noticed a black woman of indeterminate age sitting and looking at an array of television sets on the wall. She said to me, “Excuse me, ma’am, do you know anything about TVs?” I answered, “I don’t know everything, but I know some things.” She pointed out that the picture on the flat screen TV was not as clear as on the other ones, and wondered if that was a problem with the set. I thought about it for a while, and then realized that all the other TVs were the old, analogue type, and pointed that out to her. I said I was sure that if she bought the flat screen TV and hooked it up to cable, then she would get a clear signal. She said, “For seventy-five dollars, I could use it for a year.” She thanked me and I walked away. I thought about our discussion regarding analogue versus digital, and wondered if that woman was a Master. Right then I experienced goose bumps. Was she a Master? At the end of November 2014 I gave a slide presentation in my city, Zamora, in Spain, about the Reappearance and Transmission Meditation, with the goal of starting a new Transmission Meditation group there. My brother joined me to help with the technical aspects of the presentation. Immediately upon our arrival at the Cultural Center where the event was to take place, a short, slim lady, approximately 75 years old, with short, grey, curly hair, approached us and asked if the event was going to start at 19.30. I replied that it would start shortly, at 19.45. She showed great vitality and interest, which surprised us both very much. At 19.30 I began to prepare everything, checking the computer as well as the sound and images through the projector. I was too confident about it because in my house everything had worked well. The fact is that at the presentation hall we had problems, and this delayed the start of the event. A little while later the elderly lady returned to ask us about the timetable again, but this time she was accompanied by a man of the same age, and like her, he was tall, thin, mild-mannered and quiet, but transmitted great vitality. When I was finally able to start the presentation, I saw the couple sitting in the front row. They left a short time before the end. Could you please tell me if they were Masters who were there to encourage me at the presentation, and if so, why did the lady insist so much on the schedule? In the evening, this little story inspired us during our group meeting. Between 1988 and 1993 Maitreya, the World Teacher, gave a series of teachings and forecasts about the future. The teachings were given by Maitreya to a group of Swamis around Him in the Asian community of London. A close associate of Maitreya, who was present on these occasions, relayed the teachings to two independent journalists who conveyed them to Benjamin Creme. 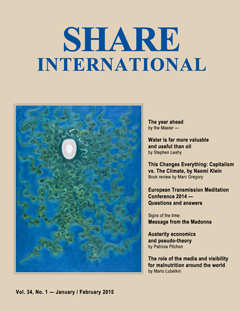 Share International published the transcripts each month, and a series of press releases were distributed to world media. The Prayer for the New Age was given by Maitreya in this way, and was first published in the September 1988 issue of Share International. This compilation gathers quotations from Maitreya about Self-Realization, and questions and answers by Benjamin Creme about The Prayer for the New Age. The selection comes from Maitreya (Maitreya’s Teachings, the Laws of Life) and Benjamin Creme’s writings. The Prayer for the New Age, given by Maitreya, the World Teacher, is a great mantram or affirmation with an invocative effect. It will be a powerful tool in the recognition by us that man and God are One, that there is no separation. The ‘I’ is the Divine Principle behind all creation. The Self emanates from, and is identical to, the Divine Principle. Q. Is it really possible to overcome fear by the use of the Prayer for the New Age given by Maitreya? A. Try it and find out. If I say yes, some of you might believe me, but I could be wrong, you can only know this for yourself, by using it. You can only overcome fear by yourself, nobody can teach you. I believe it is possible. You have to make it your own experience before you can know whether it is true or not. Likewise with this New World Prayer, try it, use it daily and build thereby a different type of identification. We identify with the Self, or with anything and everything other than the Self. We identify with That or we identify with the vehicles which the Self uses to manifest itself at this level, this physical plane in which we experience ourselves as separate. If you are identifying with the Self you do not have to ask that question, you will already know. If you have to ask the question, you are not identified with the Self, so my suggestion is to use the Prayer for the New Age given by Maitreya and find out what happens. Being and Becoming are two modalities. Being is unchanging, whereas becoming is a process in time and space. Man, in his Being, is the Self. In his becoming, he is the soul – the reflection of the Self. Mind, spirit and body are the temples of the Lord which man inhabits. Spirit is Shiv-shakti, which is energy. Mind is Brahma, which is thought-formation. Body is Prakriti, which is material substance and can also be thought of as material activity. These terms can be thought of as nouns, but they can also be thought of as movement or processes. The destiny of the Self is to be free. Considered in its freedom, in its Being, it is called Atman. Within the limitations of time and space, in its becoming, it is the soul, or Jiva. The Self is not energy (Shiv-shakti, spirit); the Self is not thought-formation (Brahma, or mind); the Self is not material activity (Prakriti, the body). The destiny of the Self is to enter and leave these temples of the Lord at will. A. The two things are different. There may be some undercurrent of relationship but on the face of it they are not connected. He has said: “I have come to teach humanity the art of Self-realization,” and for those who can use the Prayer for the New Age, that is a powerful tool for bringing oneself into correct relationship with the Self. It brings about Self-awareness, and Self-awareness is the necessary step to Self-realization. You cannot become Self-realized unless you are Self-aware, and He has said you cannot become Self-aware unless you have self-respect. In these centres, the young people are taught, if that is the right word, are brought into the condition of having, perhaps for the first time in this life, self-respect. They may be on drugs, in alcohol abuse, from broken homes, in criminal activities, vandals, social misfits and so on. They are brought together in these centres which are a kind of therapy situation for their psyches. They are taught what people in other situations would take as a matter of course, self-respect, because if you do not have self-respect, no progress of any kind can be made. These people lack self-respect, which is why they are in crime. Inwardly they sense themselves as souls, but on the outer plane, as a result of bad education, bad social circumstances, bad influences, they find it impossible to give expression to that inner sense of themselves as divine Beings. So they are at war with themselves, and, as an extension of themselves, with the society of which they are a part. Disciples would not be disciples if they had that problem, but some disciples have terrible problems, just as difficult. That is the result of glamour, and the particular problems which disciples face. The disciple is taking a conscious step in the direction of Self-realization. That is what everybody, consciously or unconsciously, is seeking to attain, and, of course, will eventually attain. Self-realization is the goal of our incarnational experience. Most people who are already disciples will have self-respect enough to take them on the path. The Great Prayer, or Affirmation, is given for all to use. Of course, you can use it at different levels. The devotional type will use it in the same way as he would say the Lord’s Prayer: Give me, give me, give me. Forgive me, forgive me. Likewise with the Prayer for the New Age, you can say it mechanically or you can say it in such a way that it really fulfils every astral longing you ever had. That is one way and it will be used in that way, probably, for the next thousand years. Then, there is the way it should be said which I cannot tell you, which is the experiencing of it as you say it. You have to experience it, nothing happens unless you experience it. You have to be the Self as the vehicle is saying the mantram. You can only become what you are. There is nothing to be learned. You can learn everything out of every book that has ever been written and be as unaware in relation to the Self as you were before you started. You can only begin to experience the Self when you go beyond thought; then you experience the real. That is the given state, the nature of the Self. That is you. You are the creator of the Universe, there is not anything else, but you have to get rid of wrong identification. It is not something you can acquire by knowledge, there is no acquisition involved in experiencing the real. That is why a little baby, who does not know anything in terms of knowledge, has not gone to school yet and had its knowledge patterns distorted, is fresh, does not think, just experiences directly as a soul experiences its own Being. That is how you have to be, like a little child, directly, without any preconceptions, any constructions of thought, because every thought is a hindrance to the experience of the real which is the Self. The more evolved the disciple, the more he will use that mantram as it is meant to be used, that is, to bring one into identification with the Self. The Self has always been there, we are unaware of it because of wrong identification. It needs a shift of vision, of identification, from the relative to the absolute, from the vehicle to that which is using the vehicle, the Self. A. Yes, indeed. All the Masters respond to prayer – that is how prayer is answered, not by people sitting up in heaven, there is no such place. Heaven is a state of Being, and that, the heavenly kingdom, is the Kingdom of Souls. The Masters are wide awake, They never sleep, and They hear every prayer. Whether They can answer that prayer depends on the strength of the invocation, on what proportion of emotional or mental matter the prayer is wrapped in. The higher and the more mental the matter in which the prayer is wrapped, the more impact it makes on the minds of the Masters, because They work on the mental not the emotional planes. There are plenty of beings on the astral planes who respond to astral-type prayers, but the Masters Themselves respond on the mental and super-mental planes, the soul or spiritual planes. So the higher you can make your invocation through prayer the better. More important even than that is karma. The Law of Karma controls the action even of Masters in relation to prayer. Certain invocations have been released to the world by the Masters as prayers. Maitreya Himself has released a World Prayer for the New Age to bring about one’s sense of oneself as divine, as the ‘creator of the universe’, as identifying with God…. In this coming age humanity will gradually recognize its identity with the Self or God. Seeing God not only as ‘up there’, but immanent in every aspect of creation – that there is no separation whatsoever between God, nature and humanity. Everything interrelates. The Malaga lights were spaceships from the planet Mars. Malaga, Spain – Taken on the night of 8 February 2015 by José Rodriguez, this photograph shows 57 points of light moving at the same speed from East to West. The Tynemouth object with pulsating lights was a spaceship from Mars. The Avare white orb was a spaceship from Mars. The Porto Alegre fiery object was a spaceship from Mars. Images of Ganesh and Sai Baba showing manifestations of vibhuti (sacred ash) and amrit (dark honey-like nectar).Photographs taken by T.L., Edmonton, Canada. Patterns of light on a hotel in William Street, Atlanta, Georgia, USA. Patterns of light on a hotel in William Street, Atlanta, Georgia, USA, late October 2013. Sent in by D. B., Galveston, Texas, USA. ‘March for change’ in Madrid. Around 300,000 supporters of Podemos (“We can”, in English), the left-wing party that is threatening to overhaul Spain’s bipartisan party system, marched in downtown Madrid on 31 January 2015, in a show of force at the beginning of a busy year of elections. The ‘march for change’ was the most important rally organized by Podemos since it emerged as a newcomer in Spanish politics last May, when it won almost 8 per cent of the Spanish vote in elections for the European Parliament. Tens of thousands of people marched in Madrid on Saturday in the biggest show of support yet for the anti-austerity party Podemos, whose surging popularity and policies have drawn comparisons with Greece’s Syriza. Crowds chanted “yes, we can” and “tick-tock, tick-tock”, to suggest that the clock is ticking for Spain’s two main political parties. The march on Saturday ended in the Puerta del Sol, the Madrid square that became the centre of a nationwide, youth-led movement 15M seeking to overhaul Spain’s political system in May 2011. The party is leading opinion polls ahead of local, regional and national elections this year. The party’s rise is greatly due to the charisma of its pony-tailed leader, Pablo Iglesias, a 36-year-old political science professor. Hailing from the Madrid working class neighbourhood of Vallecas, Iglesias prefers jeans and rolled up shirt sleeves to a suit and tie and champions slogans such as “Spain is run by the butlers of the rich” and that the economy must serve the people. Mr Iglesias promised that Podemos would soon oust the Popular Party (PP) from power. He accused the government of Mr Rajoy of “wanting to humiliate our country with this scam that they call austerity”. “People are fed up with the political class,” said Antonia Fernandez, a 69-year-old pensioner from Madrid who went to the demonstration with her family. She and her husband live on a combined pension of €700 (£524) a month. Fernandez said she used to vote for the socialist party but had lost faith in its handling of the economic crisis and its austerity policies. “If we want to have a future, we need jobs,” she said. Former Irish President Mary Robinson, now the UN special envoy for climate change, is calling all countries – developed and developing – to co-operate to reduce greenhouse gas emissions. Ms Robinson said that developing nations need to join the rest of the world in ending greenhouse gas emissions to halt the rise of global warming. She questioned the idea that those countries should be afforded more time to reduce their carbon footprint and said such views are no longer acceptable if we as a planet are to significantly reduce carbon emissions by 2050. Her comments, made at a climate conference in Dublin, Ireland (February 2015), come in the aftermath of the 2014 Lima agreement on climate change, which produced the first ever unilateral international dedication to curbing greenhouse gas emissions. “The impacts are going to be worse on developing countries and communities, so they must be right there at the beginning and not locked into dirty fossil fuel infrastructure,” she said. “It is unreasonable to expect developing countries to reduce emissions on their own at an equivalent stage of development to when British countries were dramatically increasing theirs. The only feasible way to achieve this is through the provision of support, both financial and technological,” she added. The US public overwhelmingly supports government action to limit global warming, according to a poll conducted by The New York Times, Stanford University and Resources for the Future, a nonpartisan environmental research group. Seventy-four per cent of Americans said that the federal government should be doing a substantial amount to curtail climate change, the poll found. In another notable result, a growing percentage of people in the US believe that climate change is caused at least in part by human activities – the number increasing from 72 per cent in 2011 to 81 per cent today, according to the poll. Support for significant government action against climate change varied by political affiliation, with 91 per cent of Democrats, 78 per cent of independents and 51 per cent of Republicans in favour. The findings show that about half of Republicans in the United States are at odds with their party’s leading figures, including many who are possible candidates for the 2016 presidential election. Forty-eight percent of Republicans say they are more likely to vote for someone who supports fighting climate change. Seventy-two per cent of independents expressed the same view. A large majority of Americans, including 61 per cent of Republicans, believe there will be grave problems in the future if nothing is done to curb greenhouse gas emissions. The latest report, concluded on 29 March 2014, from the UN Intergovernmental Panel on Climate Change (IPCC) predicts a probable rise in global temperature exceeding two degrees Celsius, the internationally agreed upper limit considered to be the threshold to ‘dangerous climate change’, by the late 21st century. Water scarcity could lead to conflict between communities and nations as the world is still not fully aware of the water crisis many countries face as a result of climate change, the head of the UN panel of climate scientists warns. “Unfortunately, the world has not really woken up to the reality of what we are going to face in terms of the crises as far as water is concerned,” said IPCC Chair RajendraPachauri at a conference on water security.